When his home and the adjoining boys' school that he ran were destroyed by fire in 1865, Edwin Whitney of Mansfield started anew: he would rebuild the school. He did rebuild. But before the four-story frame building with its two-story ell was finished, Whitney offered it and 50 acres of farmland to the Connecticut General Assembly, to be a home for the orphans of Connecticut's Civil War dead. In 1876 - one year after the last orphans had outgrown their state-provided home - the building, some additional outlying buildings, and the property were given to Whitney's widow (he had died in 1867). She in turn sold them to Augustus Storrs, who in 1880, with his brother Charles, offered the land, the buildings and $5,000 to the state to begin an agricultural school for boys. That yellow building housed the original Storrs Agricultural School - forerunner, after several changes in name and mission, of the University of Connecticut. It was located on the corner of what is now Route 195 and North Eagleville Road. Condemned as unsafe by a state commission in 1886, Old Whitney Hall survived numerous remodelings and alterations before it was razed in 1932. The steps to the first Whitney Hall, near the southwest corner of North Eagleville Road. Pictured to the right in the background is the Storrs Congregational Church on North Eagleville. But there is still a piece of the old wooden structure in its place - not a wooden piece, but a solid granite slab that was the front step of the building. Just a few yards from the sidewalk, the step bears a plaque commemorating its place in University history. By 1934, two years after Old Whitney was torn down, what had been Storrs Agricultural School had been through two name changes - in 1893 it became Storrs Agricultural College, and in 1899 it became Connecticut Agricultural College. Athletic teams were referred to as Connecticut Aggies. When the name changed to Connecticut State College, campus sports writers began referring to The Connecticut Statesmen. But it didn't sit well with students, especially when a football rival like Rhode Island brought its ram mascot to Storrs on November 9, 1934: CSC students kidnapped the ram. Soon after that the student newspaper, then known as The Connecticut Campus and published every Tuesday, launched a contest to select a mascot. The winning entry was the Husky, suggested because the winters in Storrs were as cold as those of Canada's Yukon Territory. After a five-month-old black and white Husky pup arrived on campus in December, the alumni paper - The Connecticut Alumnus - launched its own contest to give the mascot a name. That winning entry was Jonathan, inspired by Jonathan Trumbull, Connecticut's Revolutionary War-era governor. The CSC mascot was cared for in the home of music professor Herbert France - who would write the words and music to "UConn Husky", the song familiar to any fan of UConn athletics. But just weeks after arriving on campus and appearances at a few basketball games in Hawley Armory, Jonathan I was struck by an automobile and died. On a cold Friday afternoon in February 1935, as students gathered around, the four class presidents lowered a blue-and-white box that served as a coffin into a small grave. A bronze plaque now marks the burial site: it lies at ground level among flowering plants and bushes, sometimes covered by mulch and hidden, just a few feet behind the granite step of Old Whitney Hall. 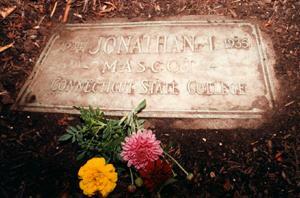 Jonathan I's grave marker, near the corner of Rte. 195 and North Eagleville Road, just behind the stone step to Old Whitney Hall. 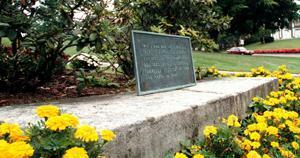 The marker was proposed at a meeting of the Student Senate on November 23, 1937, and was put in place behind the Old Whitney granite step around May 20, 1940. An article in the May 23, 1940 Connecticut Campus noted that "the dog marker has been erected at the North end of the campus." Sources: Connecticut Agricultural College - A History, by Walter Stemmons, 1931; 1935 Nutmeg, Thomas H. Sutcliffe, editor-in-chief, 1935.